Editing rib and rsl files with Cutter offers many advantages compared to using a general purpose text editor. Cutter applies syntax coloration to both types of scripts. Rendering a rib file and compiling a shading language document is conveniently accomplished using the keyboard shortcuts Alt + e, Control + e or Apple + e. If the URL to Pixar's documentation has been set in preferences then Command + double clicking on a keyword in a rib or rsl file will trigger Cutter to display the relevant Pixar documentation. - convert an RSL function to a HyperShade node. It is assumed the reader has installed Pixar's RenderManProServer and has followed the "Cutter setup" and "RenderManProServer setup" instructions. By default, Cutter writes a slim file for each shader it compiles. As shown below (emit slim doc) auto-generation of slim files can be turned off. 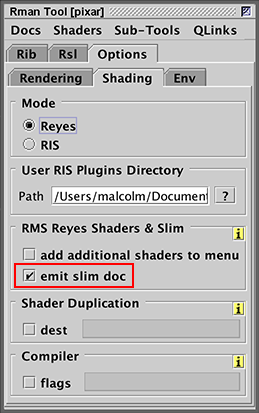 Slim files are only relevent if you intend to use your shaders with Pixar's RenderMan for Maya. If your shaders will be used with Side Effects Houdini, "Output to Houdini OTL" should be activated and a path should be set to a shared OTL file. If the path is left empty Cutter will create a OTL file for each shader it compiles. Initially, Cutter will indicate the file does not exist ie. Ignore the warning. The path will change from red to black once the OTL is created. The process of developing and testing a shader consists of repeatedly cycling through the following five steps. Open a copy of a "constant_test" shader ie. Compile the shader - keyboard shortcut Alt+e, Control+e or Apple+e. Cutter will ensure the compiler will save the shader to the users "shaders" directory. Open a rib file to test the shader ie. Cutter will generated a rib file that references the compiled shader and its default parameter values. Save the rib file and render it - keyboard shortcut Alt+e, Control+e or Apple+e. It is often very useful to animate the parameters of a shader in order to see how surface opacity, color and displacements interact. Importing a shader into Maya or Houdini is a time consuming process although, of course, such applications enable an artist to fully assess a shader. Cutter offers a simple keyframing facility that enables animations to be directly and quickly created. For information about this topic refer to the tutorial "Cutter: Key Framing". 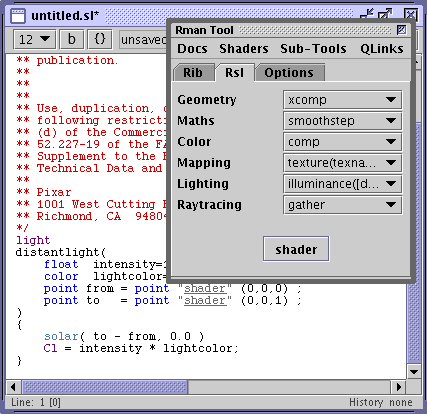 If the ALT or CONTROL key is pressed when a shader is chosen (figure 3), Cutter will find the corresponding .sl file and display a copy of it's code - figure 4. To open Pixar's documentation CONTROL + double click on the name of a datatype or RSL function. On MacOSX the keyboard shortcut is APPLE + double click. 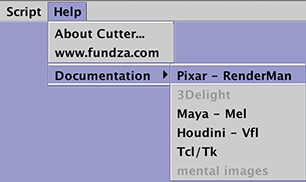 The Rman Tool provides quick links to selected RenderMan topics - figure 5. The Help menu also provides a quick link to Pixar's documentation.